We are finally getting back into a normal routine after the holiday. We begrudgingly went back to work on Monday, I dragged myself out of bed at 6.15am in the cold darkness to go to my Pilates class and I already broken my “I’m going to read every night before bed when we get home instead of wasting time on social media” promise that I made to myself whilst reading a book poolside on the last day of our holiday. It’s amazing how quickly normal life resumes and the holiday is quickly nothing more than a little smile that crosses your face when you remember the feeling of laying on the sand, the warm sun in your face and the waves slowly creeping up towards your toes. I have also started getting a few blog posts ready. 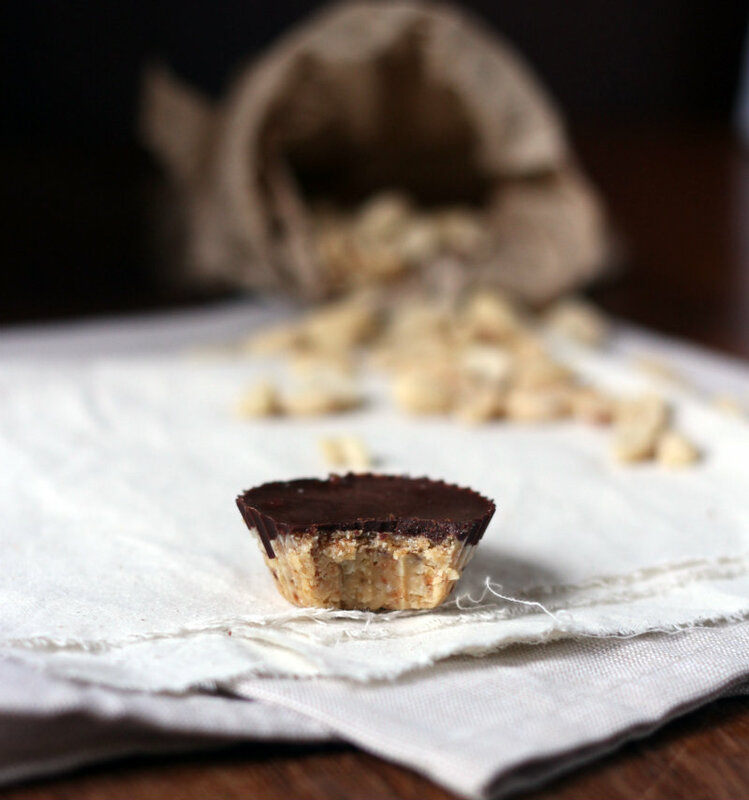 I wanted to share with you some of my travel snaps (which you can see here and here), but now that that’s done, I’ve been saving a few delicious recipes for you, and what a better place to start than thee Salted Chocolate Peanut Butter Cups! These tasty little treats need no introduction really. Dark chocolate. Peanut butter. 5 ingredients. Need I say more? One of my good friends Georgie is expecting her first baby any day now and requested my Peanut Butter Jelly Cups for her baby shower. Unfortunately, my local store was out of frozen blueberries so I decided to improvise a little instead, and quickly came up with these. 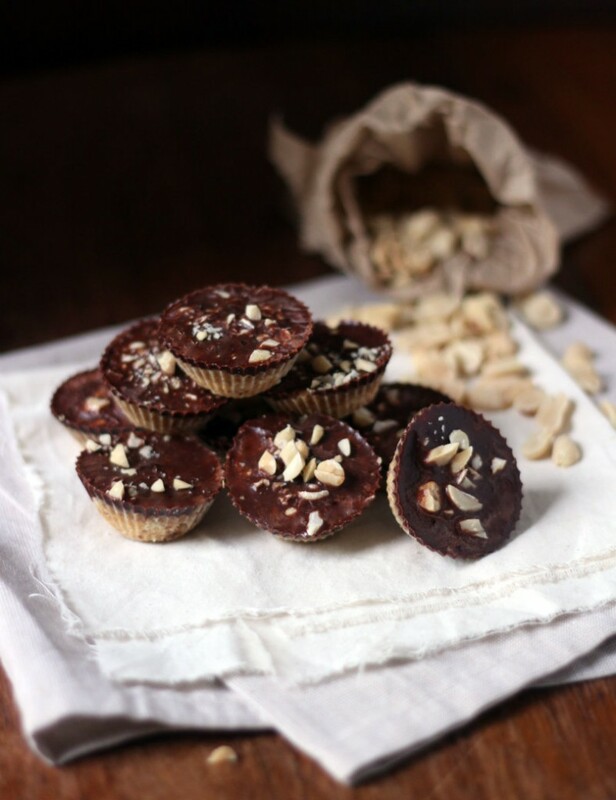 These little bites are made with peanut butter, but I imagine any nut butter would work – almond would go a treat and of course hazelnut always pairs so beautifully with chocolate. Add all of the ingredients for the base to a food processor and mix a few minutes until a smooth ball has formed. Using a teaspoon, scoop out the mixture and press into mini cupcake liners, filling each half way. Place in the freezer whilst you make the topping. Top with crushed peanuts and salt. Store in a sealed container in the fridge. These look so good! It’s so hard adjusting after a holiday. Wow good on you getting up that early for pilates! That’s dedication! 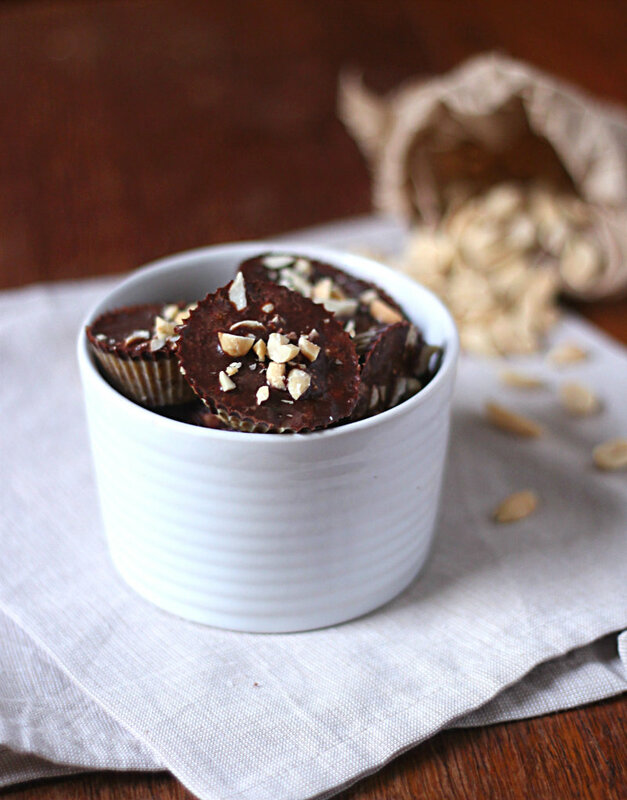 Dearna, I made this yesterday with hazelnut butter, and they are amazing. Got the seal of approval from the guy in the house too. ;-) Love having these small bites stashed in the freezer for whenever I need a sweet treat, which is usually everyday! Thanks for a wonderful clean dessert recipe.